STUNNING SOUTH FACING CORNER UNIT with SPECTACULAR RENOVATIONS in this fully finished 2 storey town home offers a QUIET & PRIVATE setting. 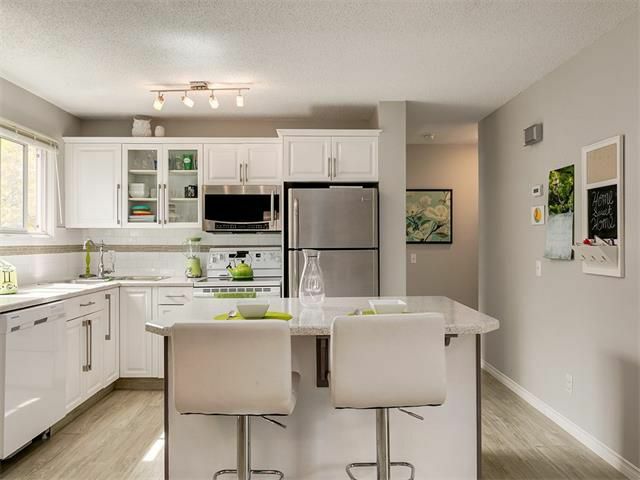 You will be wowed as you step into this MODERN & CONTEMPORARY open concept floor plan w/ New Kitchen-New Cabinetry-New Counter tops-Kitchen Island, New Tiled Backsplash & Stainless Steel Appliances. CHIC new light fixtures, Trendy New Paint, New Maple Hardwood, New Carpet, New Wide Plank Luxury Vinyl tile thru-out this home. Main floor also features large living room w/patio doors leading onto a SUNNY & EXQUISITELY LANDSCAPED PRIVATE yard. Office/bedroom & 2pc complete this level. Upper level boasts large Master bdrm, 2nd bdrm & fully renovated 4pc bath. Fully developed lower level w/ open recreation & media rms, laundry rm & large storage space. Steps away from walking paths, dog park, tennis courts all showcasing views of COP, Mountains & COP. Close to schools, Crowfoot LRT & shopping. CLICK ABOVE FOR VIRTUAL TOUR... with more details. RARE FIND-2 parking stalls!